Star stitch, sometimes called a twinkle stitch, is a simple embroidery stitch made with basic straight stitches. It's perfect for adding little details in and around your embroidery. There are a few ways to make this type of stitch, and the diagrams here and examples below will show you how. You can make a star with a few straight stitches that all share a common point in the middle and then radiate out, similar to an eyelet stitch or the start of a spider web stitch. But the version you'll see here resembles a collection of cross stitches instead. To form an 8-point star stitch, come up through the fabric (point 1) and go back down a short distance below (point 2), making a vertical stitch. Bring the needle back up centered and to the left of the first stitch (point 3). Take the needle down through the fabric to the right of the first stitch (point 4), forming an upright cross stitch. Come back up between points 2 and 4, and then go down between points 1 and 3. Bring the needle up again between points 2 and 3, and go down between points 1 and 4, completing the star. This is only the basic way to make this though, so try working it with a variety of points and stitch lengths. Read on for examples and tips. The 8-point star stitch looks a lot like a Smyrna cross stitch, and when worked on evenweave fabric, the material itself gives you a framework for achieving even stitches. In surface embroidery, however, you have a lot of flexibility with how to work this stitch. For example, rather than keeping all of the straight stitches the same length, make some longer or shorter. One of the examples in the photo shows a longer vertical stitch, with the smaller stitches toward the top, giving the star a bit of a tail. You might make the vertical and horizontal stitches longer and the diagonal stitches shorter. These small adjustments alter the look of the star significantly. 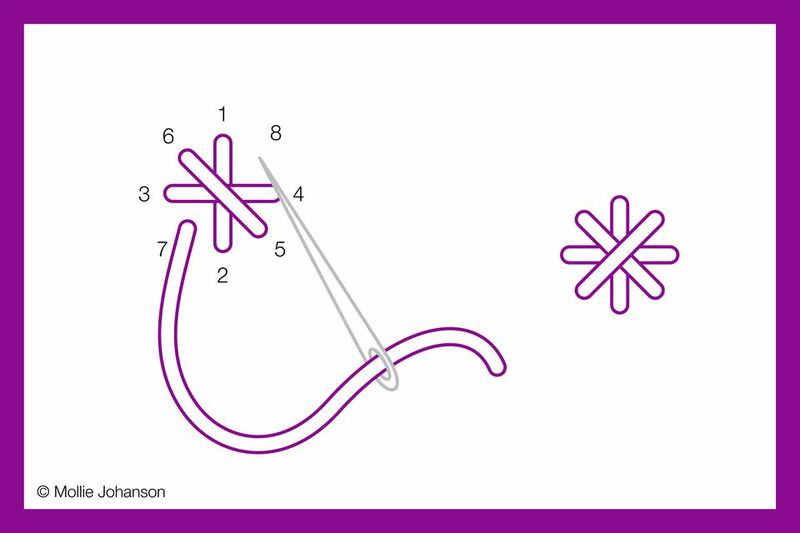 Instead of working four straight stitches, use just three stitches to make a 6-point stitch. Following this same idea, try making the stitch with more points. When adding more straight stitches, a small star can start to look overly crowded and less like a star. Sometimes that's the look you want, but for when you want to see those points, use fewer strands of embroidery floss, or make the stitch larger. If you are making larger star stitches, you may find that the center is a little loose or that it is prone to snagging. Fix this with a tiny tacking stitch in the center, as shown on one of the 6-point stars pictured. 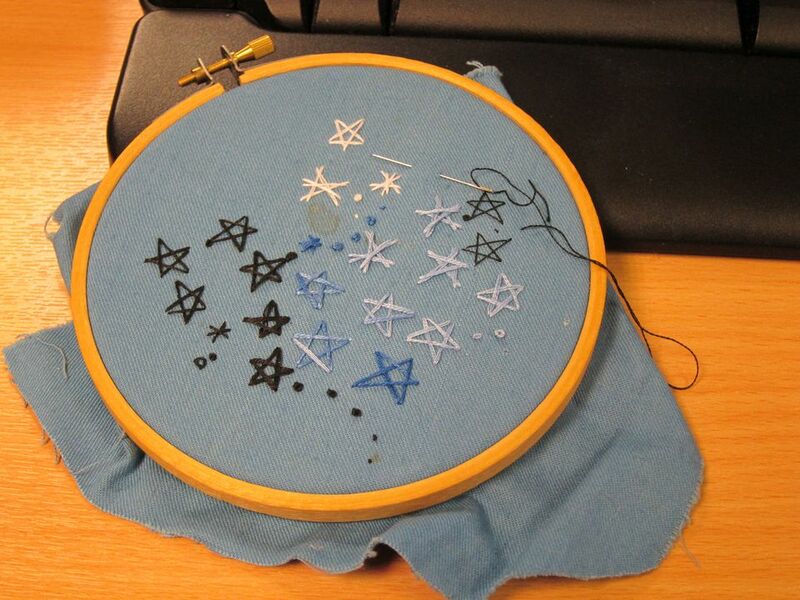 As their name suggests, tiny star stitches make excellent stars in a nightscape or for stitching constellations. They're also good for adding a bit of "twinkle" to projects, whether you're ​adding some extra sparkle or not. When stitched in white, these stitches resemble snowflakes in a winter scene, but then transform into miniature flowers when worked in bright colors alongside other florals. It's even a great scattered fill stitch! Try adding star stitch to your embroidery any time you need a little something extra.